Wet soil is not an ideal environment for many shrubs that can fall victim to fungal diseases like root rot. Shrubs that grow in wet areas naturally will thrive in it in a garden setting and are good choices for planting near a pond or stream. Shrubs that like wet soil are available in all but the very coldest areas and come with either deciduous or evergreen leaves. Sweet pepperbush (Clethra alnifolia) is also known as summersweet. The plant is a spreading shrub that grows from 4 to 8 feet tall with deciduous leaves that grow from 2 to 3 inches long and turn a gold-yellow in the fall. The tiny, white flowers bloom in the summer, growing in clusters at the tips of the twigs. Sweet pepperbush does its best in dappled light, but can take full sun or full shade. The plant grows in wet soil in its native environment and that will make it grow larger, but the plant can survive in other soils. Sweet pepperbush is a good choice for planting near a pond or by a stream, and butterflies will stop by for the nectar. The shrub is hardy in zones 4 to 9--all except for the coldest and the hottest areas in the continental United States. 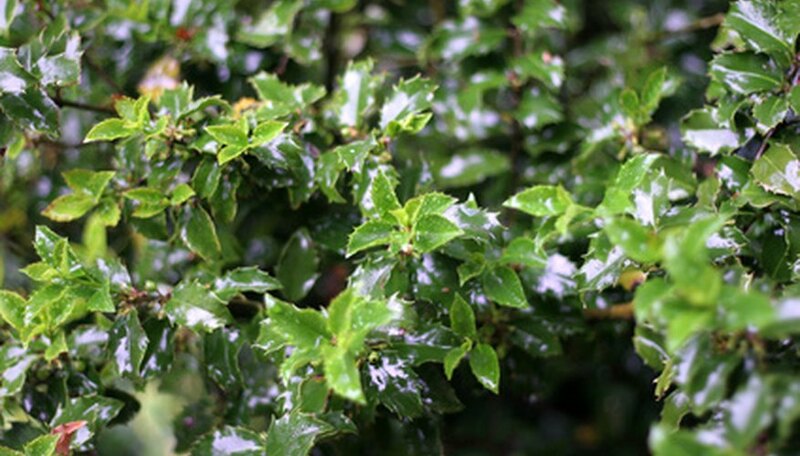 Gallberry (Ilex glabra) is also known as inkberry, bitter gallberry, evergreen winterberry, inkberry holly and Appalachian tea and is a member of the holly family. The shrub is an evergreen that grows from 4 to 8 feet tall producing thin, oval-shaped leaves with dark-green on the top and a lighter green on the bottom that grow from 1 to 2 inches long. The small, white flowers appear in the spring. The plant will be either male or female. On the male plant, the flowers grow in clusters, and on the female plant, they grow singly. The female flowers produce small, green berries that turn black when ripe. Gallberry will grow in full sun, very light or partial shade and likes soil that is moist to wet. The plant is hardy in zones 5 to 10--from Southern New England through the Central Mid-West, as far south as Southern Florida, the Gulf Coast and up the West Coast including Utah, Nevada, Oregon and Washington. Southern bayberry (Myrica cerifera) is also known as southern wax myrtle and wax myrtle. The shrub is evergreen or semi-evergreen that grows up to 25 feet tall, with narrow gray-green or yellow-green leaves that grow from 1 to 5 inches long. The flowers appear in late winter, with the ones on the male plants growing in yellow-green clusters that grow up to 1 inch long. The female flowers are no more than little bumps that become small, blue berries. Plant southern bayberry in full sun to partial shade and in a wet soil. The plant is hardy in zones 7 to 10--from Virginia to Southern Florida, from North Carolina across the deep south to the Gulf Coast and up the West Coast of California, Oregon and Washington. Arbor Day Foundation: What is my arborday.org hardiness zone?